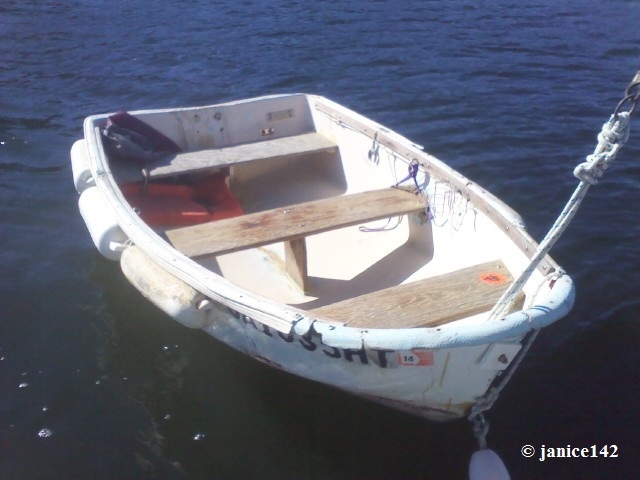 On ours we had an 8' Walker Bay that we could stow using Weaver davits on the stern platform mated to clips on the dinghy's transom. With the dinghy flipped up you lost rear vision but it was useful for dock space and limited space situations. We did normally tow. Conrad - that looks as if it might work for us as well. I'll check out those Weaver davits. Was it difficult to lift the dinghy up long-wise like that? Keeping in mind that the Walker Bay is a light boat it was not too bad for hoisting up provided you had a long enough line attached to the bow of the dinghy. I put a wood spar on each of the aft corners of the stern. Mounted on the deck between the aft cabin and the gunwale. They (one each side) extended aft of the transom about 3'. To recover the dink I'd stand on the corner of the aft deck w the dinghy to stbd in the water pointed toward me. One foot on the deck next to the transom and the other on the spar about 12' out. I'd pull on the painter (line) attached to the bow of the dink. The line would be over the top of the stbd dinghy spar. The dink would rise up until it became very difficult to pull. I'd step forward some and pull the dinghy bow up and on top of the spar. Then tie down. One needs good balance and reasonable strength but I never had a mis-hap. The dinghy was left upright and required drains. I used the screw in type. The dinghy was high enough so the extra length could extend out on either side. A great advantage of this system was that standing in the aft cockpit one could see all of the horizion over the gunwale of the dinghy. We went from the Seattle area to Juneau AK and slightly beyond (and back) w this dinghy arrangement and it worked very well. Launching and retrieving was easy enough so that we used the dinghy often and it was always well above any stern seas. Inexpensive too. Looks like your dinghy is heavier than ours was. You may need to modify the system. Perhaps hinging the spars, making them longer and pulling the dink up sideways .. from aft. With the hinges you could dump the dink and let the spars come up and fwd or down so as not to suffer the added length re morrage rates. All good ideas. I could also see the practicality of weaver davits. Eric's transom looks quite a bit rounder than yours does....not sure that would make a difference. That is a really spiffy Albin Trawlette. I find myself (being skill-challenged) thinking that there must be a real simple method whereby I could line the dink up sideways to the swim platform with a line attached to the outboard gunwale amidship for hauling out. Somehow hook the inboard gunwale onto the platform, haul on the line and secure the dink on its side on the SP with a tie-down strap (or summat). You need a pair of those Weaver things (hinges) to attach the near gunwale to the swim platform and then pull the dink up w a line to the other side. If the Swim P is too high the dink will obliterate all visibility aft and possibly redirect some exhaust noise and fumes toward the boat. Wind may be an issue too. If the swim P is too low the visibility will also be lost and lots of exhaust noise will be redirected (by the dink hull) into the aft cockpit. And the dinghy will be vulnerable to getting ripped away w big waves especially if it's longer than the transom is wide. The transom on the older Albins is narrow. And since the dink is low it will be vulnerable to getting damaged hitting pilings or floats while landing the boat. Something we do a lot of. But the height of the swim P is basically determined by the freeboard of the dinghy you probably don't have much/any choice there. And in either case (and w my system) there is the additional vessel length issue for moorage. But these problems seem to be tolerated by many as huge numbers of trawlers (especially small ones) are equipped this way. But/and if the fumes, noise and vulnerability don't become a very objectionable issue then your'e home free as is often said. One could fall in the water retrieving the dink using the method I employed and it adds more overall length to the boat than the Weaver method. The gunwale hinged dink on the SP is so easy to deploy and retrieve it's hard not to do it that way. The main reason I went to the horizontal spars was to get good visibility aft and keep the dink away from waves. It was a system I put together quickly for a trip to Alaska. And I mention it as it worked well. Since the Weaver method is so very easy to use I'll say it's better for almost all small boats and especially at resale time. I may have been lucky to sell my Albin w the odd dinghy system. But now that I'm 73 instead of about 63 and if I had another Albin I'd prolly do the Weaver thing also. I have the later model so if the width of the transom is greater than the 7 foot length of the dink, it won't be by much. The exhaust is (for some reason) just below the Water Line so oughtn't to be caught by the dinghy. As for visibility aft, I would think the dinghy would be under tow much of the time while underway. I do not intend to pay close to $300 for some Weaver hinges and bolts (unless all else fails). I should be able to jury-rig something more basic, depending upon where the gunwale meets the SP in the water. I also have to weigh the dinghy. I find it hard to judge from picking it up. Update: the dink weighs in at around 75 lbs. 7.5 ft long and 3.5 ft. wide. I found a solution for under $20. That sounds quite narrow. Basically .... small. Does it involve repetitive use of a chainsaw and glue? I'll post a pic of the hardware later today. The set-up will use the peg-and-post system used to attach the wooden sides to a flatbed trailer - but sideways. I think the pic will make it clear. As for smallness - I may have the width wrong because it looks small but no smaller than a small dinghy might be expected to look. No doubt it will be somewhat tippy compared to an inflatable. OK good. I'll bet it's probably about the same as the dinghy I had made for my Albin. It may have been only 7'. Had a reverse curve stem like many Dutch boats. An excellent little boat built by "The Dinghy Co" in Mt Vernon WA. He makes his molds off of old wood boats that have long histories of excellence. Known to be especially good boats. Tippy? If you're a seasoned boater you know better than to board a small boat like a dink or a canoe in any other way than to step aboard w your foot placed in the center of the bottom of the boat and keep your body weight almost entirely on that foot until your'e seated. Many "seasoned" boaters think that's too much trouble and have guests aboard that know nothing of this. Many or even most boaters just feel insecure (tippy wise) w/o a Livingston style or extreme beam inflatable. And thus most dinghies are more like barges than boats and handle like .. mini barges. I have one myself and hate it. Bought it just because it was light. Should have got the 35lb model w/o the transom. But I wouldn't worry about tippy Sunset. I also consider a dinghy fairly useless in the NW US unless my wife and I can carry it up the beach or back down when the tide goes out. But then the tide is coming in half of the time. And the heavy planing dinghies have wonderful advantages too .. like the ability to run up a river or inlet where the mother boat can't go. Or just take a fun wind in the face ride. The perfect dinghy can only be a magic carpet. MB - I'm sure this dinghy will be perfectly adequate for our needs at present. We are quite used to canoes for example. So here are the pics of the hinge system which I hope will work out for me. The first pic shows the parts, and the second shows the position, with the lower pieces to be attached to the outside hull just below the gunwale. I will have to pull the swim ladder part way up after swinging the dinghy up into position. The hinges being so close together could put considerable forces on the gunwale. For this dinghy mount you could consider a longer aft board to make the hinge points further apart. You're swim step is extremely like the one we had on our Albin. Ours was shaped much like an artist's pallet. The name of our Albin was "Trawlerette" as in small trawler. Well, the dinghy is (only) about 70 lbs, and I figure if the hinges are much further apart there will be too much of a bow at the center along the gunwale to permit the rig to work properly. As well, all parts will be through-bolted - backed by wood blocks and a steel strip on the dinghy, and through the 1.5 inch wood planks on the platform. The alternative would be to rig it so that the full weight rests further inboard onto the platform itself. That will depend on the performance of the dinghy-platform-water interface once this gets water-borne in the Spring. Regarding tippy... I have a circa 1972 fiberglass dink. It WAS tippy but with the addition of old fenders along the side (3 on each and I'm looking for two more smaller ones for the transom) it is stable -- far more than anyone would think. I can stand anywhere inside except forward of the front seat without giving a spectacular demonstration of my swimming skills. It's not pretty but I'll bet you could make it look better with nicer fenders. Mine were mostly retrievals and dumpster acquisitions. But they work. The wood trim on the inside is also on the outside at the top of the gunnels because after a time the boat started to kind of ooze. That offers structural stability. The lines that attach the fenders are simply drilled thru the hull and tied.